kayak in from the north. The third seemed by far the best way to do it, although a kayak / hillwalking trip would be new territory for me. Iain and I drove to Corran (past Glenelg and Arnisdale to the end of the road, passing the foot of Beinn Sgritheall) and we parked at the new Community Hall, an excellent facility. 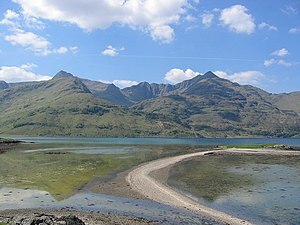 It took us just 45 minutes to kayak the 3 – 4km to Barrisdale Bay, hugging the north shore of Loch Hourn. Along the way we stopped at one point to watch a young golden eagle just sitting on a rock ledge keeping watch. It was finally chased away by a territorial hawk ! We’d timed our journey to make sure that the tide was with us and being just after low tide meant that we had to haul the kayak up the beach a couple of hundred metres until we reached the grassy foreshore. We weren’t the only ones making this trip; it seemed that another couple of groups had kayaked from Kinlochhourn in the east. Still hopeful that the clouds would part, we pitched our tent at the ‘campsite’ beside the bothy, had a bite to eat then set out to climb Ladhar Beinn. Even with low cloud I have to say that the route up Stob a Choire Odhar has absolutely stunning views – definitely top of my list of hills to return to in clear weather. Today, unfortunately, the cloud base was around 800 metres and we missed the extensive views of Loch Hourn and over to Skye. We descended via Mam Barrisdale and managed a late tea just before it got dark. Next morning we packed up our gear and loaded it on to my inflatable kayak, just as the other kayakers were doing the same. It was all rather comical. Our gear was stuffed in and strapped on top, and we were wearing walking trousers and cagoules. Our, slightly more expert friends, had fancy sea kayaks with all the right clothing and other gear. One had even brought a little trolley to take his kayak to and from the water. (They’d just done it for the kayaking, however, and seemed to have stayed in a house in the Bay …).We reversed our route back to Corran, this time battling a slightly stronger wind. (Interestingly, in spite of our close studying of the wind direction and weather pattern, the wind was coming from exactly the opposite direction to that we’d anticipated). It was pretty tough paddling into the wind but easily more preferable to the long walk in via Kinlochhourn and the less interesting ascent from Inverie. We finished our trip with a great seafood platter at the Glenelg Inn – what a great end to a fantastic trip !